The Course Home is the first display you will see when you enter each course. 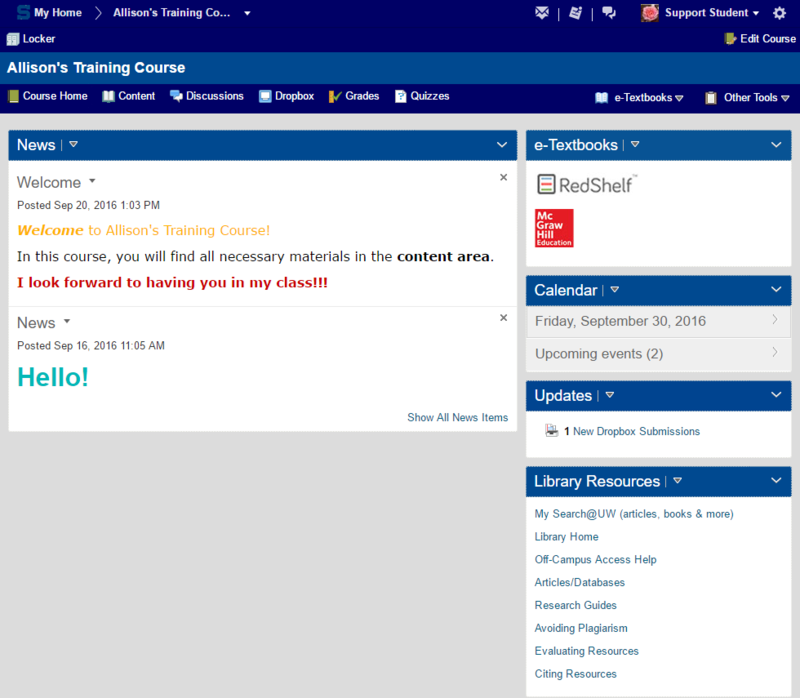 Included on the Course Home page are the news, e-textbooks, calendar, and updates specific to the course. Library resources are also easily accessed from this page. 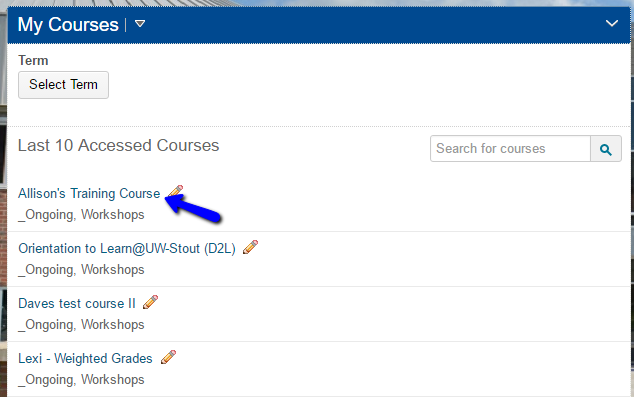 In order to view the course home page click on the blue title of your course on the Learn@UW-Stout homepage. This bring you to a page with news, e-textbooks, calendar, and updates specific to the course. 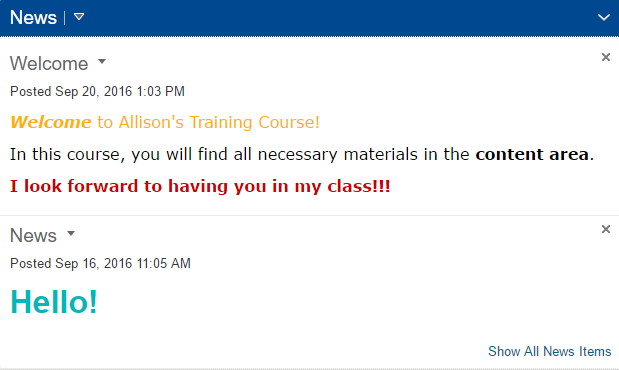 This is your course home page. The news section of the course home is a tool that instructors may use to introduce the class, direct you to other parts of the course, summarize that day's class, and post important reminders. This area also indicates when each news item was posted. The calendar tool allows you to view upcoming events in a chronological order that makes organizing upcoming Dropbox due dates and quizzes easy. Selecting the item will also allow quick access to the Dropbox or quiz. Above the listing of dates is a complete calendar. 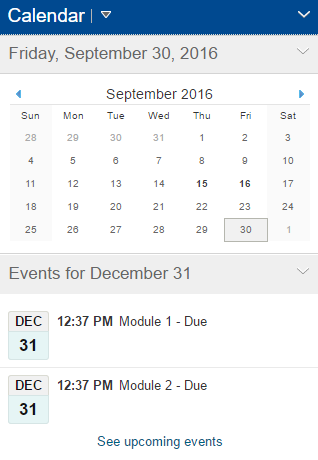 If you select a date that does not have a scheduled due date, you also have the option to create an event. The updates tool displays important activity within your course. Items such as available quizzes, instructor feedback, unread discussion posts, and updated grades will be displayed in the updates. You can easily access these items by selecting the blue content. This will take you to the quiz, feedback, discussion, or grade item. 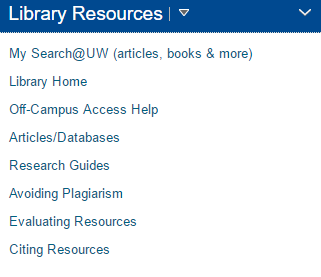 The library resources section is a tool that allows easy access to a variety of webpages with important information pertaining to research and the library's online card catalog.